GDDR6 Assertion IP provides an efficient and smart way to verify the GDDR6 designs quickly without a testbench. 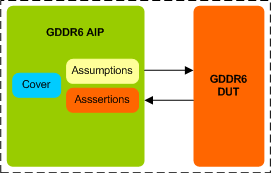 The SmartDV's GDDR6 Assertion IP is fully complian with standard GDDR6 Specification. Supports GDDR6 memory devices from all leading vendors. Supports 100% of GDDR6 protocol standard JEDEC(Proposed), JESD250 specification. Supports all the GDDR6 commands as per the specs. Supports 2 separate independent channels with point-to-point interface for data, address and command. Supports Double Data Rate (DDR) or Quad Data Rate (QDR) data. Supports Pseudo channel mode operation. Supports up to 32GB device density. Supports X8 and X16 Mode. Supports Bank grouping and 16 internal banks per channel. Supports Data bus inversion (DBI) & Command Address bus inversion (CABI). Supports Read/Write data transmission integrity secured by cyclic redundancy check. Supports READ/WRITE EDC on/off mode. Supports Programmable EDC hold pattern for CDR. Supports Auto refresh & self-refresh modes. Supports Vendor ID1 and ID2 for identification. Supports COMMAND ADDRESS, WCK2CK,READ/WRITE Training mode’s. Supports IEEE.1149.1 boundary scan operation. Quickly validates the implementation of the standard GDDR6 protocol JEDEC(Proposed), JESD250 specification. Constantly monitors GDDR6 behavior during simulation. Protocol Checker fully compliant with GDDR6 Specification compliant. Supports Simulation mode (stimulus from SmartDV GDDR6 VIP) and Formal mode (stimulus from Formal tool). Rich set of parameters to configure GDDR6 AIP functionality. SmartDV's GDDR6 Assertion env contains following.